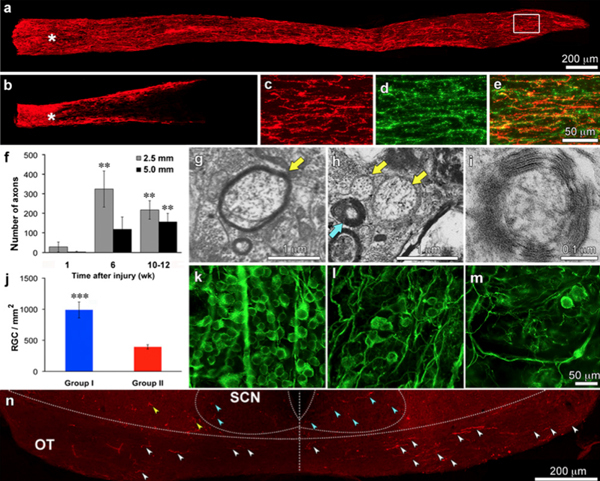 Like most neurons in the CNS, retinal ganglion cells (RGCs) cannot regenerate injured axons, and consequently, victims of traumatic or ischemic nerve damage or degenerative diseases such as glaucoma cannot recover their vision. In recent years, investigators have discovered ways to enable RGCs to regenerate axons part way through the optic nerve, but it remained unknown whether these axons could be made to extend all the way from the eye into the growth-suppressive environment of the mature brain nor whether the elaborate guidance systems that direct axons to their correct destinations during development persist into maturity. Most of all, it was unknown whether regeneration could restore functional circuits. This paper from the Benowitz lab examined whether recovery could be achieved in adult mice using a combination of treatments that cause mature RGCs to revert to a robust growth state. One of the most effective treatments was to activate a limited inflammatory response in the eye, which causes an influx of immune cells that produce oncomodulin and other growth factors; another was to elevate cAMP levels, which enhances the ability of oncomodulin to bind to its receptor and stimulate outgrowth from RGCs; a third was to delete the gene encoding PTEN, a suppressor of signaling through the PI3 kinase-Akt pathway. When combined, these treatments enabled RGCs to regenerate their axons along the entire length of the optic nerve, across the optic chiasm, and on into the brain, where they navigated to the dorsal lateral geniculate nucleus, superior colliculus, suprachiasmatic nucleus, and other visual areas. As a result of this rewiring, mice showed some signs of visual recovery, including entrainment of their circadian activity patterns to the ambient day-night cycle, an ability to follow movements of the whole visual field (optomotor response), and avoidance of depth on a visual cliff apparatus. There is obviously further work necessary to augment the levels of regeneration and develop ways to translate this work in ways that could be applied clinically, but the potential of this work is compelling.